Making new candles out of the ends and melted bits of old candles is a great way to recycle materials and save some money. Learn how to take those pieces of old wax and turn them into a new candle that can be just as pretty as one you purchased. Before you start melting and pouring, you should spend some time thinking about what you want your candle to look like, and then sorting the available wax accordingly. Unless you're going for a really grubby, unpredictable shade of brown, you should sort your wax according to color. White wax can be mixed with other colors but keep in mind that it will lighten the final shade. Some colors will look good blended together, such as similar shades of green and blue, or some reds and pinks. Overall, for the best results, stick with like colors as much as possible. Black candles can be unpredictable. Sometimes they can act as a way to darken the color of your candle, while other times they'll change the color completely. Use these sparingly, or throw them into the mix if you aren't afraid to experiment. If your wax bits are scented, you may run into trouble with competing scents once you try to combine them into the same candle. The overall effect can be overwhelming, and not necessarily attractive. Use unscented candle wax, or combine pieces that are similarly scented. Each wax has a different melt point (the temperature at which the wax melts), so combining them can sometimes be tricky. Gel wax especially should never be used along with the others unless you are an experienced candle maker and know how to blend waxes. Most store-bought candles are made of paraffin, including bulk tapers and container candles. If in doubt, check the manufacturer's website for candle ingredients. Perhaps the best option for using up old candle pieces is a layered container candle. You don't need any fancy equipment, and you can use up all the colors of the rainbow in one finished candle. 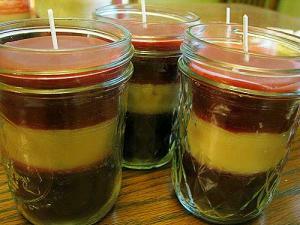 To create the layered candle, follow the instructions for making a basic container candle with a few key alterations. Using the cutting board and a sharp knife, chop up the candle pieces. Remove and discard any bits of unused or used and charred candle wick that you come across. Place the chopped wax into the coffee cans, using one can for each color. Fill the pan up with several inches of water and bring it to a low simmer. Select the color of wax you want to use for your first layer, and place that coffee can into the simmering water. Stir the wax as it melts, and remove any other bits of old wicking or char that may float to the surface. Using the candy thermometer, check the temperature of the wax occasionally. When it reaches 165 degrees Fahrenheit it is ready to pour. Take the cotton core wick and dip the bottom of the tab into the melted wax. Place the tab into your candle container and make sure it's centered. Remove the coffee can from the simmering water using oven mitts or tongs, and replace it with the can containing your next layer of wax. Carefully pour the melted wax into the wicked container to the thickness you desire. Continue working this way, pouring each layer when the wax reaches 165 degrees, wiping off the thermometer between colors. You can reuse the same color more than once by simply reheating the wax in the coffee can. When the container is full to within an inch of the top, save a bit of the wax in the last color poured. Set the candle aside and allow it to cool and harden for at least an hour. After the hour has passed you'll notice that a small indentation has formed around the wick. Reheat the remaining wax in the last color poured and fill in this indentation. Allow the candle to harden for several hours, then trim the wick to 1/4 inch before using. You can make almost any kind of candle using stubs and old pieces of wax. Just keep in mind that, unless you made the original candles yourself, there's no way to guarantee the quality of the wax for fancy molds and other advanced techniques. Votive candles or tea lights - These small candles are the perfect size for a limited supply of wax. 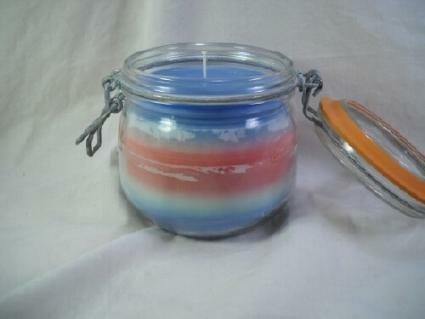 Chunk candles - Combine purchased wax with your scraps to create one-of-a-kind, eye-catching candles. Store your candle stubs, old dinged up candles, and scrapings from the bottom of container candles in an airtight container or zippered freezer bag. When you have enough of them to make a new candle it's time to get creative!